Hey y’all! 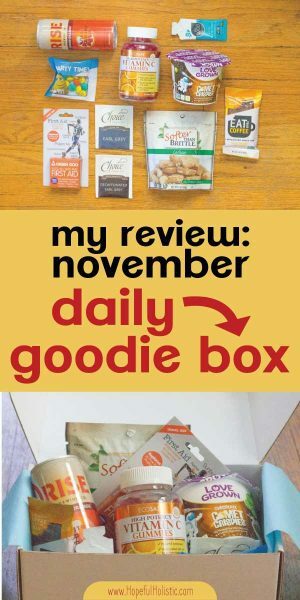 I recently received my Daily Goodie Box for November- I love getting a new box of completely free goodies to try each month! It’s a fun way for me to learn about new brands I haven’t heard of, and I get to try (or give away- it happens) so many neat products! There are also some great coupons included in the box each month. Scroll to the bottom of this post to find out how you can start getting a Daily Goodie Box too! This month, my Daily Goodie Box included a mix of foods and treats as well as health and wellness products– those made me excited! I dug into some of the foods immediately. Hubs helped. So without further ado, here is my unbiased and honest review of the products I received! This stuff is probably the neatest thing I received this month. It’s a blend of healing herbs and plant-based oils that help with recovering from cuts, scrapes, blisters, chafing, poison ivy, cold sores, dry hands and feet, and sunburns. What doesn’t it do? 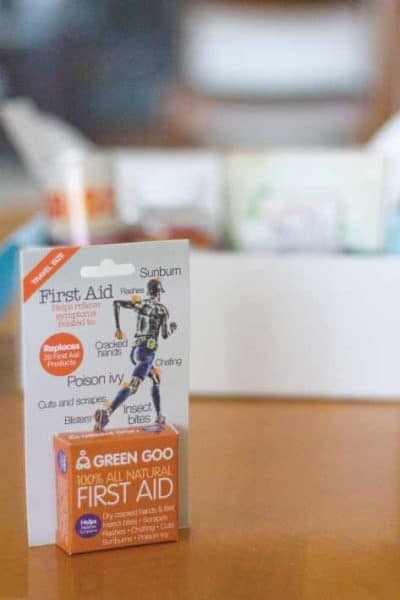 The packaging proudly boasts that this balm replaces 20 first aid products- and I believe it! Not only does it replace them, but it also gives you a healthier, all-natural product that supports your body’s natural healing abilities. Green Goo includes herbs like comfrey, calendula, and plantain, all of which are great for helping your skin recover. It’s loaded with soothing, pain-relieving, and nourishing herbs and oils. This is one of those products that says “all-natural” and means it! There’s no petroleum, parabens, phthalates, or any other harmful artificial ingredients. That’s hard to find in skincare items! I’ll definitely be keeping this around- I love the ingredients and I’m sure it will come in handy! I received a bag each of decaffeinated and regular Earl Grey tea from Choice Organic Teas. They’re both completely organic, with simple, natural ingredients- just black tea and organic bergamot oil. Side note- do you pronounce the “T” in “bergamot”? I’ve heard it both ways. Let me know. I’m looking forward to making some delicious London Fog (an Earl Grey tea latte) with these! Have you ever heard of a caffeinated snack bar? I hadn’t til I got this! It’s an organic snack bar made with dates, oats, and roasted fair trade coffee beans– and apparently, there’s the equivalent of a cup of coffee in every bar! It’s got chicory root fiber and brown rice protein, so it should help keep you from feeling hungry along with giving you an energy boost! The ingredients are impressively clean, and it’s fairly low in added sugar. Now, I don’t think anyone should need to rely on caffeine to get through the day (and if you’re trying to cut out caffeine you can try my coffee substitute recipe!) but having a bit of caffeine every now and then isn’t bad for most people. A lot of protein-packed health bars are hard, flavorless, and don’t have a great texture, but I loved how this bar is chewy and deliciously coffee-flavored! It’s yummy and satisfying without being too sweet. I’d definitely buy a pack of these in the future! I was excited when I saw that my Daily Goodie Box included a full-size bottle of Vitamin C gummies! Who says gummy vitamins are just for kids? I was surprised when I tried a couple, though… They’re super sweet! It’s like candy. It might be organic cane sugar, but it’s still sugar. I wouldn’t recommend these gummies to anyone trying to get over a cold or UTI- sugar will slow down recovery and could make things worse. Another issue I have with these vitamins is that they include a form of Vitamin C known as ascorbic acid– which is only one isolated part of Vitamin C.
More studies need to be done, but some studies have suggested that high levels of ascorbic acid (around 500mg/daily or 4 of these gummies) can put you at risk for numerous health issues. (source) It would be so easy to eat that many gummies! Studies also need to be done to see if ascorbic acid is actually beneficial. You might just pee out most of it and not get the health benefits you want. So although I won’t be buying these (I’d rather opt for a whole foods Vitamin C) I’ll still enjoy these as a treat! They really do taste good. The back of the packet of this cashew brittle invites you to “sink your teeth into this delicate, flavorful, palate pleasing treat” and oh man do I want to! It looks wonderful. But then I looked down at the ingredients- Peanuts, corn syrup, sugar, cashews, baking soda, natural flavor, sea salt. Why corn syrup? Hubs told me that it’s hard to make brittle without using a sugary syrup, which is sad! I haven’t eaten corn syrup regularly for so long that it gives me a headache pretty immediately if I try it now. I don’t eat it and I don’t miss it. The packaging talks about “back to the basics” and “all natural ingredients” but that doesn’t really make it true or good for you. Even “natural flavors” can be problematic- more on that here. If it really tastes good, why add natural flavoring at all? I kind of want to try making a healthy, homemade, sugar-free cashew brittle myself- just to see if it’s really possible. I’ll keep y’all posted if I manage it! For now, someone else will have to enjoy these treats. I got a sample size of sport sunscreen (say that five times fast) from All Good. It’s broad spectrum SPF 30, non-greasy, and water and sweat resistant! It’s also reef friendly- this is super important if you’re going snorkeling or swimming out in the ocean near any reefs! There was also a card included with this sample, describing how, in July of this year, Hawaii became the first state to ban reef- and people-damaging sunscreens. There are also plenty of natural, skin-friendly, herbal ingredients in this sunscreen, and the active ingredient is zinc oxide, which is much better for you than the nasty chemicals (including oxybenzone) you find in conventional sunscreen. You can see more of my top picks for natural sunscreen on my post about sunburn remedies here. I’m really looking forward to trying this sunscreen- partially because it’s a great product, and also because I miss the sun and warmth and snorkeling. (I was living on the coast in Mexico this time last year) Sigh. Maybe someday I’ll move back there! Say whaaaat! 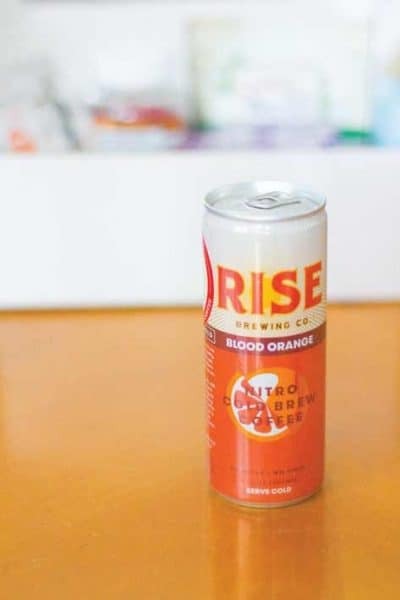 I love nitro cold brew (cold brew has more caffeine but it’s less acidic, easier on your stomach) and I’m a millennial so I love blood orange– but I never would have thought of putting the two together. This is an intriguing combination! This drink is dairy free and has organic, non-GMO ingredients, no artificial flavors (it’s actual blood orange juice), and not too much sugar. It’s small but has plenty of caffeine. Hubs wasn’t too impressed by the flavor- he doesn’t like anything fruity combined with his coffee or chocolate (sometimes I buy blueberry chocolate or put mint in my coffee just because I know I won’t have to share- don’t tell him!). But I thought it was delicious. Overall, a great product and very yummy. I’ll definitely keep an eye out for more of Rise Brewing Co’s cold brew! Oh and don’t forget to recycle the can! Aluminum is one of the greatest things you can recycle because its lifespan is nearly infinite. Now that that’s out of the way, this looks delish! It’s non-GMO, gluten-free, and vegan. The cereal is called “Chocolate Comet Crispies” (fun, right?) and it’s made with a bean blend and other wholesome ingredients. It does have natural flavor and cane sugar, but I’ll still happily try this cereal! Hubs had the great idea of making chocolate crisp bars with these by pouring melted chocolate over a layer of cereal and letting it cool. I think I’ll do that! Oh man. M&Ms. I used to be addicted to them- dipped in peanut butter, snuck into movie theaters, and eaten by the bag-full (not fun-size bags, either). But when I started eating more healthfully, I started enjoying processed, sugary, chemical-laden foods less and less. Even M&Ms. And even if you can personalize it to say happy birthday to your dog. These candies have 16 ingredients (why is that necessary? ), but only three or four that I’m ok with ingesting, such as cocoa butter and salt. The other ingredients include corn syrup, soy lecithin, artificial flavors, GMO ingredients, and fake coloring. The chemicals in artificial colors (listed in ingredient lists that have colors followed by numbers) have been linked to hyperactivity in children and cancer. (source) And the sugar makes this treat addictive and unhealthy. I’ll have to find someone to take these off my hands- but I’m sure that won’t be hard! Or I guess I could just toss them, eh? What do you think of the goodies I got? Do you want to give your opinion and get your own free Daily Goodie Box each month? 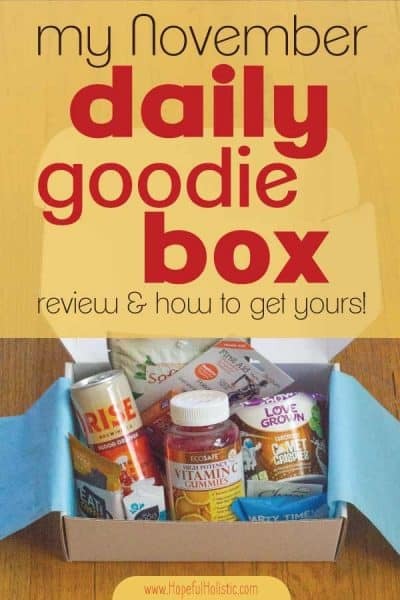 If you want to get started, just visit DailyGoodieBox.com – it’s 100% free and will never ask for your card information!